All stainless steel 304 / 316 / 316L CGMP or mild steel externals with stainless steel internals (vapor and product contact parts). Hollow pad type heating shelves which are easily removable for maintenance. Condensor and condensate receiver fitted on the dryer body or stand alone for remote installation. Fully welded skirt on vacuum dryer body for flush mounting through the wall. External insulation of dryer with protective panels in stainless steel or mild steel powder coated. 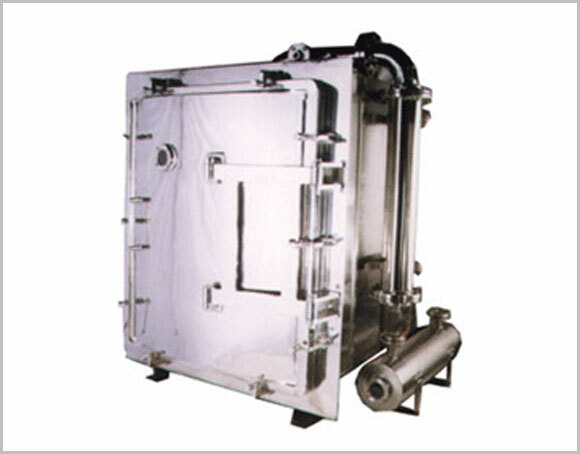 Dedicated fluid heating and circulating systems. These can be steam or electrically heated. Fluid heating systems are available for water as well as thermic fluid ( for temperature requirements above 95 degree centigrade ). Validation ports and nitrogen purge nozzles. Can be designed to customers specific requirements. Double door loading available for larger models. Tray size is 16 x 32 x 1.25 (h) inches Tray volume is 10 liters Tray height can be increased to a maximum of 2 inches Center to center distance between any two shelves is 4 inches.